Even at the age of ten Doug had a reputation for knowing how to handle a horse. That reputation has grown through the years. He is recognized as one of the top trainers in North America. 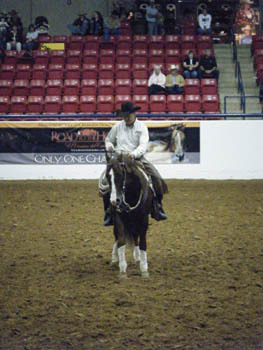 His workshops, clinics and retreats are renowned among horse enthusiasts. As well as teaching people and horses how to get along, Doug competes in trainer events. He’s a five time winner of Trainer Challenges: twice in Canada and three times in Europe. These trainer contests are invitation-only events. Just three trainers are chosen to compete. Horses at the Mane Event in Chilliwack are provided by the Douglas Lake Cattle Company, a ranch with a lot of room for wild horses to run. It’s not so easy to find space in Switzerland. Unbroken horses used in competitions there are actually bred in Austria, where it’s easier to keep them as free from being handled as possible. In a typical Trainer Challenge, trainers must get an unbroken horse to stand to be saddled and mounted, and learn to pick up its feet. There’s a lot of working in the round pen. “If we put too much pressure on them in the round pen, we find that, in the big arena, resentment comes out. The trick is to do just enough, not too much.” ,is how Doug sums it up. Horses have to walk, trot and lope on the rail, then do a series of obstacles: a bridge, a rope and a tarp. They have to drag a log behind them, stand while the mounted trainer swings a lariat, and accept being loaded into a trailer. 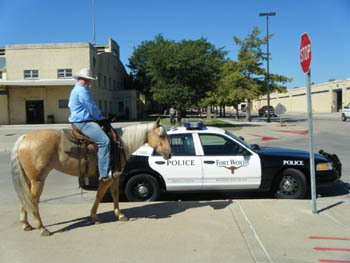 Project Cowboy, held Oct. 8th, 2010, at the Will Rogers Equestrian Centre in Fort Worth, Texas, was much more than a typical trainer challenge. As well as selecting ‘the great American horse trainer ‘, organizers used it as a pilot for a proposed reality TV show featuring horses and their trainers. The Mills family responded. Doug, his son Kyle, and daughter Kaylee, entered. All have placed first in contests in Europe. This summer Kyle won the Trainer of the North Challenge in Smithers, B.C. Broke horses were allowed in this competition. “Judges want to see how broke your broke horse is.” , says Doug. It took four eight hour days to trailer the four Mills horses from their home at Erin Valley Stables in Kamloops, B.C. to Fort Worth. 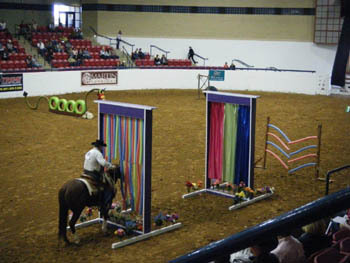 Because trainers were encouraged to bring their own broke horses, it opened the event to many who wouldn’t have competed in regular challenges. About one hundred and sixty-five riders registered. There were several elimination rounds. 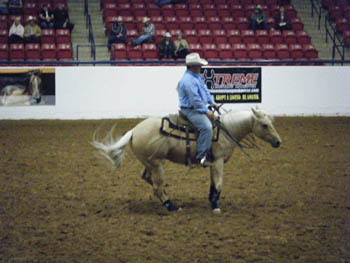 In the first round, the trainer had to have the horse lead at a trot, pick up its back feet, be at a lope within twenty or thirty feet, accept being mounted from the wrong side, stop, and back up, then do a riding pattern which required sliding stops, rollbacks, spins and lead changes. TV cameras were everywhere. “They were in our faces the whole time. They’d show up any time. They’d go to dinner with you!” Contestants just had to get used to it. 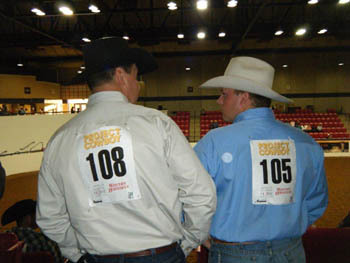 Contestants were given twenty-five minutes in the round pen. There was a five minute break after fifteen minutes. “In case too much pressure was being put on the colts, organizers wanted to give them a break. “ Doug doesn’t think it was necessary, and believes it probably won’t happen again. Contestants were judged on their ability to bond with their horses. The next round also involved a draw, for a different horse. This time they were horses from a local drill team. Competitors had to do a hunter/jumper class and demonstrate English riding. They had to do rail work: have the horse walk, trot and canter on the rail in both directions. Then they were required to pull off the saddle and take the horse over a series of obstacles. They had to go over a rail, back through zigzag rails about a foot off the ground, and go over a bridge. “All went good over the jumps. Only a couple got over the bridge. The bridge was the deciding factor.”” Doug reports. The last contest was a freestyle ‘ Ride For Your Life!’, with trainers back on their own broke horses. Sliding stops, spins and circles were obligatory. “We had four minutes to do anything we wanted to impress the judges and the crowd.” A hectic four minutes for the final ten contestants. The Mills family did well. Kyle and Kaylee ended in the top seventy five. Doug was in the top ten. Horse people from around the world came to Project Cowboy. There were Australians, Brazilians, Canadians, Europeans and, of course, Americans. Some of them probably went home with ideas for horse trainer TV shows. Doug Mills certainly did. He believes it’s possible to put one together in Canada, minus the reality part of it. He’s exploring options, taking the trainer challenge just a bit further.